A missing U.S. couple have been identified as victims in the attack at the Brussels airport, according to statements issued by their employers. 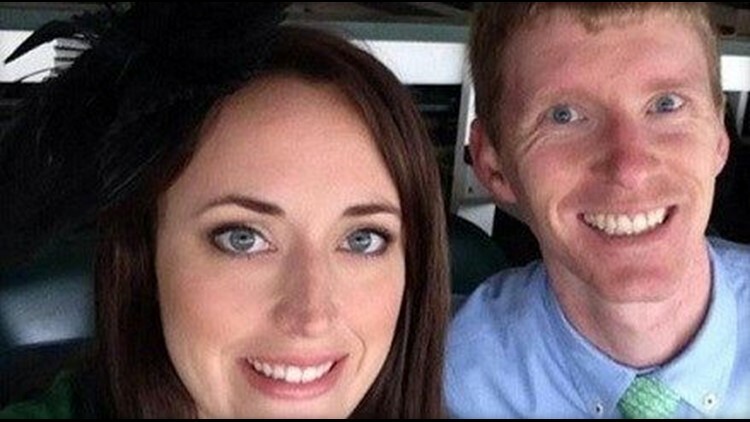 Justin Shults, 30, and his wife Stephanie Shults, had not been seen since Tuesday. Her employer Mars, Inc., said in a Facebook post Saturday evening that her family had confirmed that she and her husband died in the bombings at the Brussels airport. Justin Shults employer, Clarcor, had confirmed earlier Saturday that he died in the attack. Justin Shults, originally from Gatlinburg, and his wife, a Lexington, Kentucky, native, graduated together from Vanderbilt University's Owen Graduate School of Management. They were dropping Stephanie's mother off at the airport and were watching her walk through security when the bombs went off, a family member said. A woman killed in Tuesday's bombing in Brussels had warned four months earlier that demonizing Muslims would help drive the recruitment of extremists. Sascha Pinczowski posted on Facebook after the Nov. 13 Paris attacks that "Ignorant spreading of anti-Muslim sentiment and propaganda does nothing but benefit ISIS." The 26-year-old Pinczowski was a Dutch citizen living in New York. She and her brother, Alexander, were among the 31 people killed in Brussels. Pinczowski's Nov. 16 Facebook post was reposted by her mother, Marjan Pinczowski Fasbender, who wrote that she wanted to share "this message of tolerance from our Dear Daughter Sascha." A team of engineers and technicians say the Brussels airport building is stable despite Tuesday's bomb attack and the airport operator is ready to begin setting up temporary check-in desks. Brussels Airport said in a statement Saturday that a "provisional investigation into the Brussels Airport's terminal did not indicate any stability issues related to the terminal building." A connector building where security and hand luggage checks are made was also deemed to be safe. The airport, which handles 23.5 million passengers annually, said it would be next Tuesday at the earliest before flights could resume. The Swedish government has confirmed that a Swedish woman was among the victims of the suicide bombings in Brussels. Prime Minister Stefan Lofven made the announcement Saturday in a brief statement, saying "I mourn with the victim's family and relatives in this difficult time." It wasn't immediately clear whether the woman was killed in the attacks on the Brussels Airport or in the attack on the Brussels subway. Foreign Ministry spokeswoman Veronica Nordlund said the victim was a woman in her sixties from central Sweden. She did not give the name or other details. Another Swedish woman is still missing since the attacks. Brussels prosecutor Ine Van Wymersch tells The Associated Press that 24 of the 31 people killed in the Brussels attacks have now been identified. He says 11 of them were foreigners. One was former Belgian ambassador to the United States, Andre Adam. Of the 270 wounded, 93 are being treated at a Brussels military hospital. A doctor there says Saturday that 15 people are in a serious burns unit, five of them in intensive care. Dr. Serge Jennes says he had treated similar injuries during his service in Kandahar, southern Afghanistan, but that he and his colleagues have been shocked to see such injuries on women and children. "I?ve never seen this before in my 20 years at the center for burns," Jennes said. "Injuries linked to the blow-back from the blast, which can mutilate." He said almost all the wounded had burst eardrums. Belgium's Foreign Ministry says one of the victims of Tuesday's attacks was the former Belgian ambassador to United States, Andre Adam. Didier Vanderhasselt of the Foreign Ministry confirmed that Adam died in the attack. Adam, 79, served as Belgium's ambassador during part of the Clinton administration. He also served at the United Nations during a long career that began in 1962. Organizers have postponed Sunday's march for solidarity in Belgium after the country's interior minister appealed to residents not to attend because police are too stretched with the investigation into attacks on Brussels' airport and subway. Event organizer Emmanuel Foulon said Saturday the event would be held later. Interior Minister Jan Jambon made the appeal earlier Saturday, citing the fact that Belgium's tiny police force is stretched. Jambon says "we understand fully the emotions. We understand that everyone wants to express these feelings." The march was to take place in the Belgian capital. Thirty-one people were killed and 270 wounded in Tuesday's attacks in Brussels. Belgian prosecutors say three men have been charged with terrorist offenses linked to Tuesday's attacks on the Brussels airport and subway. Federal prosecutors said Saturday they have charged a man identified as Faycal C. for "involvement in a terrorist group, terrorist murder and attempted terrorist murder." They say he was arrested on Thursday but a police raid on his home turned up no weapons or explosives. Belgian media are reporting that a man named Faycal Cheffou has been identified has the suspected fugitive in a light-colored jacket who fled Brussels Airport after two alleged accomplices blew themselves up there Tuesday. Prosecutors refused to comment on those reports. Prosecutors say two other suspects arrested Thursday and identified as Rabah N. and Aboubakar A. have been charged with "involvement in the activities of a terrorist group." A fourth man, taken into custody Friday after he was shot by police at a Brussels tram stop, is being held for at least 24 hours longer. Belgium's interior minister has appealed to residents not to rally in solidarity for the victims of Tuesday's attacks on the airport and subway, saying police are too stretched with the investigation into the attacks. Interior Minister Jan Jambon made the appeal on Saturday. He did not demand that the rally Sunday be cancelled, although he "invited citizens not to have this demonstration." He says "we understand fully the emotions. We understand that everyone wants to express these feelings." The march was to take place from the Place de la Bourse in Brussels to the city's Gare du Nord. Belgian prosecutors have issued an arrest warrant for a new suspect in Tuesday's attacks on the Brussels airport and subway. The federal prosecutor's office said in a statement on Saturday that an arrest warrant has been issued for a man only identified as Faycal C.
The statement said he is wanted for "involvement in a terrorist group, terrorist killings and attempted terrorist killings." Brussels airport officials say flights won't resume before Tuesday as they assess the damage caused by twin explosions in the terminal earlier this week. The Brussels Airport Company said Saturday it is "currently studying a temporary solution to partially resume passenger flights, taking into account the new security measures" decided by the federal government. Brussels Airport handles 23.5 million passengers annually. It links Brussels with 226 destinations worldwide and is served by 77 different airlines.